For many years, the optimization of refractory castable formulations has been a key factor in improving the service life of unshaped materials during their application in the steel and iron industry as well as in the metallurgical industry. The incorporation of functional aggregates in common low cement castables based on tabular alumina raw materials was investigated within the framework of the study presented herein. Such an addition of eutectic aggregates aims to modify the elastic and mechanical properties of the castable leading to eventual thermal shock resistance amelioration. Different high alumina-based formulations were investigated. Starting with a reference tabular alumina-based castable, the largest grain fraction of this first formulation was replaced by three different aggregates. Andalusite was incorporated to favour microcrack formation due to in situ mullite and ensuing glass formation during the sintering process. Both mechanisms may explain the depletion of elastic and mechanical properties and furthermore the decrease of the stored elastic energy of the castable. Al2O3-ZrO2 addition may also result in crack formation because of expansion mismatch between the calcium aluminate matrix and the zirconia-containing aggregate. 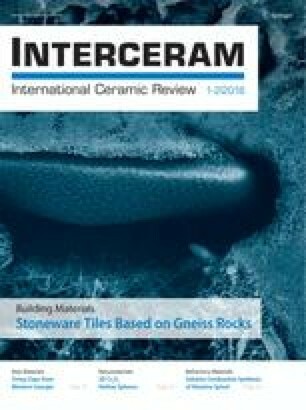 The martensitic transformation of zirconia at high temperature characterized by a considerable volume expansion is the second factor explaining the increase in mechanical stresses at the level of the grain boundaries between aggregates and matrix. An alternative to these materials was the examination of Al2O3-ZrO2-SiO2 eutectic aggregates in order to study the influence of zirconia in the presence of a silica glassy phase. This study will focus on the modification of the elastic and thermo-mechanical properties of the andalusite-based castable in comparison with the reference castable (without functional aggregate incorporation) to discuss the impact of such aggregates on thermal shock resistance.